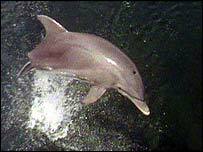 A dolphin that has become a tourist attraction off the Kent coast could be injured or die because of the attention being lavished upon it. Dave has become a frequent sight in past months, swimming along the reef between Folkestone and Seabrook. Conservationists said if Dave became tame, looked to people for contact and lost his fear of boats, he would be in danger from sea vessels. Last month, police urged people to stay at least 100m away from the mammal. Mark Simmons, of the Whale and Dolphin Conservation Society, said that watching Dave from the shore was not a problem. But he said: "The problem is when people get in the water and when boats go out to sea, because these solitary dolphins tend to become habituated and tame. "Once they become tame they lose their natural fear. "They then start to look to us to provide their social contact and their entertainment and this just leads them into trouble. "In particular they tend to get struck by boat propellers and that is not something that they are going to come well out of." Kent Police asked people to keep their distance after receiving reports that Jet Skiers, kayakers and other people in motorised boats were getting too close to Dave. People were also not to approach, grab, touch or try to swim with him. This week, the Whale and Dolphin Conservation Society and British Divers Marine Life Rescue said solitary, friendly dolphins were growing in number around the coast and were hugely popular. But they said: "Not surprisingly, people will often flock in large numbers to see them, feed them or swim with them. "Sadly, the fate of these solitary dolphins is usually not a happy one and it is often the attention from people that leads to their injury and eventual death."